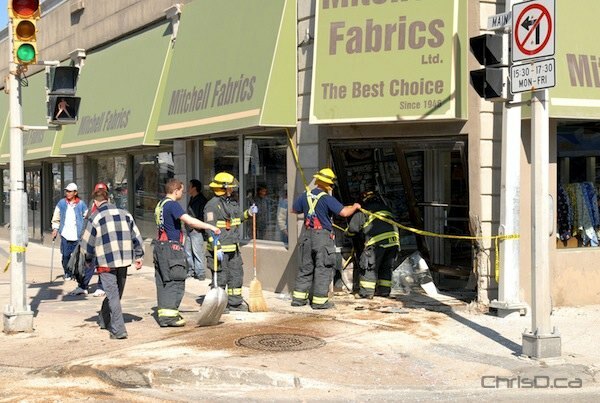 Four people are in a Winnipeg hospital after a car crashed into a store on Main Street Wednesday afternoon. The four-door Cadillac sedan plowed into Mitchell Fabrics at 637 Main Street at around 3 p.m. after colliding with a Honda Accord. Traffic was diverted around the store near Logan Avenue while police investigated the crash. One of the four people in hospital is reported to be in unstable condition, while the other three are listed as stable. 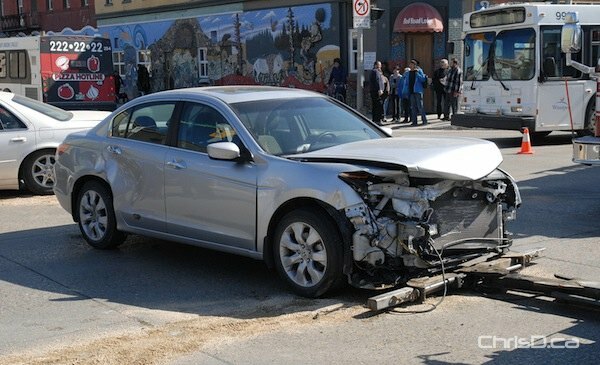 UPDATE: Thursday, April 12 — Winnipeg police have issued a ticket to the 65-year-old man driving the Cadillac, who they say ran a red light while travelling northbound on Main Street, colliding with the eastbound Accord on Logan Avenue. Drivers of both vehicles, aged 65 and 75, along with two male pedestrians, aged 49 and 51, were taken to hospital. The 51-year-old was listed in unstable condition, but has since been upgraded to stable.